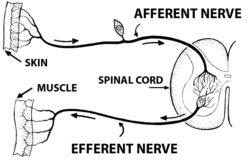 In the peripheral nervous system, an efferent nerve fiber is the nerve fiber (axon) of an efferent neuron (motor neuron). It is a long process (projection) extending far from the neuron's body that carries nerve impulses away from the central nervous system toward the peripheral effector organs (mainly muscles and glands). The opposite direction of neural activity is afferent conduction. In the nervous system there is a "closed loop" system of sensation, decision, and reactions. This process is carried out through the activity of afferent neurons (sensory neurons), interneurons, and efferent neurons (motor neurons). The motor nerves are efferent nerves involved in muscular control. The cell body of the efferent neuron is connected to a single, long axon and several shorter dendrites projecting out of the cell body itself. This axon then forms a neuromuscular junction with the effectors. The cell body of the motor neuron is satellite-shaped. The motor neuron is present in the grey matter of the spinal cord and medulla oblongata, and forms an electrochemical pathway to the effector organ or muscle. Besides motor nerves, there are efferent sensory nerves that often serve to adjust the sensitivity of the signal relayed by the afferent sensory nerve. Both afferent and efferent come from French, evolved from Latin (the basis of many terms in medicine and biology) for the terms, respectively, ad ferens (Latin verb ferre: carry), meaning carrying into, and ex ferens, meaning carrying away. Ad and ex give an easy mnemonic device for remembering the relationship between afferent and efferent: afferent connection arrives and an efferent connection exits. Motor neurons, a dynamic list of Petilla convention aligned motor neurons at NeuroLex.